National Right to Work Foundation » Charter School Teachers and Employees: Know Your Workplace Rights! Charter School Teachers and Employees: Know Your Workplace Rights! Please click here for an important legal update to the booklet for charter school teachers and employees. 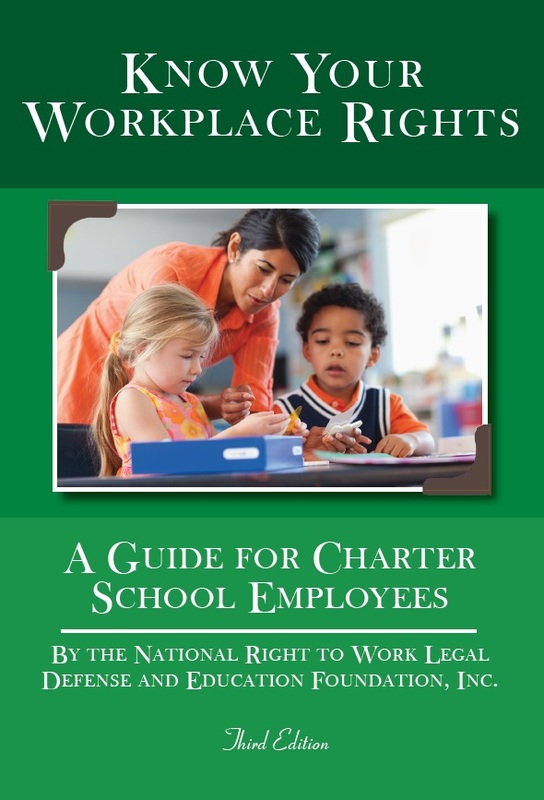 To read or receive a free copy of the Foundation’s book for charter school teachers and employees, Know Your Workplace Rights: A Guide for Charter School Employees, click here! To receive a free brochure, click here. The unionization of charter schools jumped 444 percent in the last decade, 2001-10, compared 1992-2000, and is increasing rapidly. The number of unionized schools in each state varies. During the 2009-10 school year, 24 of the 40 states with charter schools had at least one charter school that entered into a bargaining agreement with a union. In Alaska, Hawaii, Iowa, and Maryland, all charter schools were unionized, while 171 charter schools in Wisconsin were unionized, 122 in California, and 42 in Ohio — 72 percent of the nation’s unionized charter schools located within these seven states. See "Unionized Charter Schools: Data from 2009-10." Unionizing employees is to take the employee’s natural rights to deal directly with their employer regarding the employee’s terms and conditions of employment, and give it to the union, who then acts as the employees’ exclusive bargaining representative. The problem with the Soviet Union was not its leaders or its employees; it was the closed, uncompetitive economic system that stifled its innovation. We have the Soviet equivalent in our schools; it’s a system that shuns competition and thwarts change. But in America, it’s the [union] collective bargaining agreements that are the glue keeping the monopoly together. Even where a union is involved, most employees prefer a workplace where union membership and the payment of union dues is voluntary, because it forces the union hierarchy to be more accountable to rank-and-file workers. It also forces union officials to sell the benefits of union representation and membership to the individual employees, instead of resorting to threats, intimidation, and even firings to gain financial support. See "Public Opinion on Right to Work"; "Voluntary Unionism Serves Workers, Not Bosses." When there is a union in the charter school, or trying to get in, the rights of the charter school employees are covered by labor laws and the constitution. Generally, these laws provide similar rights and protections to employees in both the public and private sectors. Public-sector employees are governed by state labor laws and, depending upon specific state law, they can file a charge with a state labor board or file a claim in state court. Private-sector employees are governed by the National Labor Relations Act ("NLRA"), and they may file unfair labor practice charges before the National Labor Relations Board ("NLRB" or "Board"). The law differs somewhat between the public and private sectors. To know which rights a charter school employee is entitled, the employee must first determine if he or she is considered to be in the public sector or private sector. Step 1: Were you hired directly by the charter school or by a management company to work at the charter school? If you, a charter school employee, are hired and paid by the charter school, then the determination is based on who established and operates the charter school, and proceed to Step 2 of the analysis. If you, a charter school employee, are hired and paid by a management company (i.e. EMO, CMO, etc.) to work at the charter school, you are most likely a private-sector employee, governed by the rights and protections afforded to other private-sector employees under the NLRA, and your analysis ends here. Step 2: If you were hired directly by the charter school, how was the charter school created, and/or how is it operated? This part of the analysis originates from the NLRB’s decision in Chicago Mathematics & Science Academy Charter School, Inc. (CMSA), 359 N.L.R.B. No. 41 (2012) finding that CMSA, a private, nonprofit corporation, created under Illinois’ General Not-For-Profit Corporation Act, was a private employer under the NLRA. The Board’s decision was based on unique factors in the Illinois’ charter school law and facts specific to CMSA. The NLRB held that because CMSA was not created directly by the state of Illinois, nor had a governing board "administered by individuals responsible to public officials or the general electorate," it was a private employer under the NLRB’s jurisdiction. The NLRB specifically did not apply its CMSA ruling to all charter schools in the United States. Even though the NLRB limited its decision to the specific parties and facts involved, the NLRB will likely classify Illinois charter schools similar to CMSA as private employers. As a result, charter school employees who work at Illinois charter schools with facts similar to CMSA will likely be considered private-sector employees. If you do not work in an Illinois charter school, the NLRB’s decision in CMSA offers guidance for how the Board may classify charter schools in other states, resulting in a classification of your status as an employee of the school. A general analysis is provided below for charter school employees who are hired directly by the charter school. The charter school’s governing board is composed of and/or selected by primarily individuals who are historically considered to be public officials or selected by the general electorate. If you, a charter school employee, work at a charter school created or operating under one of the above scenarios, you will likely be considered a public-sector employee. The charter school’s governing board is composed of and/or selected by primarily private individuals, with little to no involvement by historically considered public officials and/or the general electorate population at large (not just parents of the charter school’s students). If you, a charter school employee, work at a charter school created or operating under one of the above scenarios, you will likely be considered a private-sector employee. *NOTE: Each state’s charter school law differs from Illinois’ and factors among the individual charter schools vary. Your classification as a charter school employee depends on the specific facts and law involved with your employment and the charter school at which you work. For questions about the CMSA decision, your rights, and/or whether you are covered by public-sector or private-sector labor laws, please contact a Foundation staff attorney for assistance at (800) 336-3600, by email at [email protected], or here. For questions concerning any of the above information, please contact a Foundation staff attorney at (800) 336-3600, via email or by clicking here, for assistance. What are my rights if the union is conducting a "card check" or organizing drive at My charter school workplace? If there is a union in my charter school workplace, can I be required to be a union member or pay dues to a union? How do I cut off the use of my dues for politics and other nonbargaining activities if I am forced to pay fees to a union? What is a decertification election? What if I have a religious objection to joining or financially supporting a union? If I believe my rights have been violated by compulsory unionism abuses, can I file my own unfair labor practice charges against the union or employer with the NLRB or a state agency?